While your #Samsung Galaxy #S7Edge is one of the most powerful and advanced smartphones in the market today, it’s not free from problems and errors. In fact, we receive several complaints from our readers daily about some errors that occur in their device. Some of the errors are due to apps issues while there are also cases wherein the error is just a result of a more complex firmware or hardware problems. It is necessary that you, as the owner, should take time troubleshooting your phone so as to know what the problem really is. That way, you would know what to do or what the steps you should take in a bid to fix it. In this post, I will tackle three error messages as reported by our readers. If you own a Galaxy S7 Edge and are currently bugged by an error or two, then read on as this post may be able to help you. Now, before we jump right into our troubleshooting, if you happen to find this post because you were searching for a solution to a different problem, then visit our troubleshooting page for we have already addressed hundreds of issues sent by our readers since we started supporting Galaxy S7. find issues that are, in one way or another, similar with yours and then try to use the solutions we suggested. If they don’t work for you or if you need further assistance, then fill up our Android issues questionnaire and hit submit to contact us. Give us the information we need and we’ll help you find a solution. Problem: Hi guys! I have an S7 Edge through TMo and while it has been working perfectly fine since I got it last year, recently after an update an error started showing up and it says “Unfortunately, Lookout has stopped” and I just don’t have a clue what this is all about. Please help me get rid of this error as it seems like it’s slowing down my phone not to mention very annoying. From the Home screen tap the Apps icon. Then tap My apps & games. Find Lookout apps and then tap the Update button, if possible. If there’s no update button, it means the app is already updated and in this case, you need to move on to the next step. Since the Lookout app covers pretty much everything in your phone including third-party apps, there’s a chance one of the apps you downloaded or installed is causing the problem. We need to isolate the problem immediately by booting your device in Safe mode and check if the error still shows up. 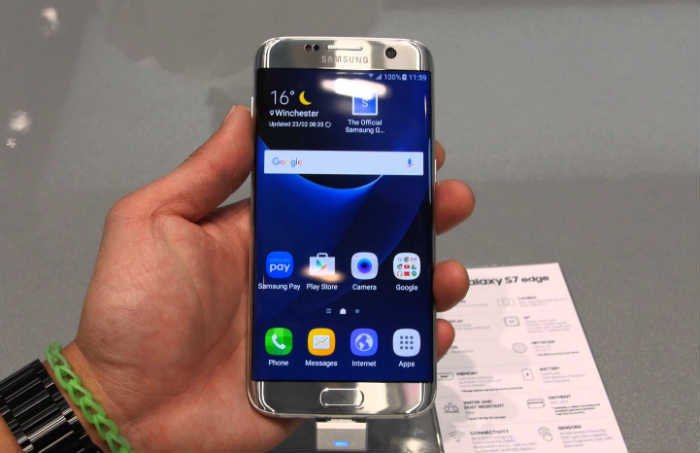 As soon as you can see the ‘Samsung Galaxy S7’ on the screen, release the Power key and immediately hold the Volume Down key. If the error doesn’t show up in this mode, then one or some of the third-party apps is causing the problem. You have to find that app and uninstall it so that Lookout won’t crash anymore. You may need to uninstall more than one app to get rid of this problem. On the other app, if the problem still continues even in safe mode, then you have to go after the firmware. If the first three steps didn’t work, then you have no other choice but to reset your device. This will delete all your third-party apps, files and data so make sure you create a backup before following the steps below. If the problem still persists after this, then you have to bring the phone to the store and have the tech take care of it. Then firmware may need to be reinstalled. Problem: I updated my Galaxy S7 Edge firmware through Wifi and for several hours my phone works great and suddenly I had this message “Weather app stopped working” appears on my screen. I tried restarting the device but the message still shows up for no reason. I hope you can give me an idea how to get rid this issue. Troubleshooting: If the issue occurs after firmware update, then it might be a system glitch and it can be fixed immediately by simple troubleshooting procedures. However, if you recently downloaded third-party apps on your phone, that may be one of the factors that we have to look into. So, if you don’t want to spend time waiting in the shop while the technician is fixing on your phone, then you can perform the basic troubleshooting procedures below. Don’t you worry, these methods won’t do any harm on your device but rather it will give you hint what caused the issue and fix it by your own. Here are the procedures that you should do. Since we are not sure what caused the issue, all you need to do is restart your device in Safe mode. The purpose of this method is to temporarily disable all third-party apps in the system to determine if one of them triggered it. If the error message won’t pop up on your screen while in this mode, then there could be a culprit on your applications . You can uninstall every app you have until the issue is fixed. If the error message still pops up while in Safe mode, however, you can proceed to the next method. There are two-types of cache your phone have, the apps and system caches. The main task of the apps cache is to store and load data every time you have to launch an app. While the system cache functions the same but it works only in the firmware of the phone. So, if those system caches had been corrupted after the update that could be one of the factors that issue persists. In this instance, the best thing that you should do is to wipe the cache partition of the phone. Follow the procedure above on how to wipe the cache partition. But if the issue still persists after the procedure, you can jump to the next method. After booting your device in Safe mode and clearing the apps and system caches and the problem remained your last chance should be resetting your device. This method is very effective especially if the device was bugged and had software problems. But take note that all files stored on your phone will be deleted. So, before you go through to the procedure make sure to backup everything. Follow the same steps as above. Problem: Hello! Since, I updated my Samsung Galaxy S7 Edge the error message started to show up on my phone screen “unfortunately messages has stopped”. I rebooted my phone several times but the problem still the same. I hope you can share me some ideas to fix my issue. Thanks in advance! Solution: As you indicated that the error message started to show up after the update, most probably your device it is a software problem. The first method that you should perform on your phone is to clear the cache and data of the messages app. After the deleting the cache and data of the app try to observe if the issue remained. If it persists, then you can jump to the next procedure by wiping the cache partition of the device. In clearing the cache directory of the device all old caches will be deleted so that your phone can create newer caches. However, if all procedures could not fix the issue the last method that you should do is to bring back the device to its factory default. But take note that in resetting the device all stored data and files will be deleted. So, before you have to proceed to this procedure make sure you transfer all of it to your PC or to your SD card.